My family loves sweets and I make them at least once a week. I have tried unsuccessfully to cut out sugar multiple times and have come to the conclusion that since we eat healthy most of the time an occasional homemade treat is fine. Additionally, I find baking very comforting. My mom and I used to bake cookies frequently together and I have passed on the tradition to my own children. There is something very comforting about baking and eating homemade cookies. In the past year I have been trying to find new ways to make sweets, while incorporating adding nutrition. Recently Better Homes and Gardens magazine had a recipe for Loaded Oatmeal Cookies using flaxseed meal and wheat germ, which looked healthy and delicious. This recipe has 15 ingredients. It makes 30 cookies and takes approximately 30 minutes of prep and 9 minutes of cooking per batch. I had no problems finding all the ingredients at my local store, even the flaxseed meal was easy to find in the organic section. I used 80 percent cocoa dark chocolate in bar form and then chopped. I found that the cookies cooked very quickly, watch to make sure they don't overcook and burn. I followed the recipe as stated, however, it could easily be modified to use almonds or sunflower seeds instead of walnuts. 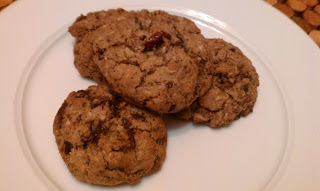 These cookies were very good and my household ate the whole batch in a couple of days. I love that they have the added benefits of flaxseed meal, wheat germ, dark chocolate, cranberries and chopped walnuts. The taste is delicious and my kids didn't notice that they were healthy. A great way to add nutrition to baked goods and would make a great healthy snack. For the recipe go to Loaded Oatmeal Cookies. I wish I was a better baker! @Olah Thanks, they were yummy! @E Thanks :) They were actually very easy so anyone would be able to make them I promise! Thanks for visiting my blog! The cookies look great.I love oatmeal cookies. @Andreea I agree with you, I love cookies also :) Thanks for your sweet comments, I hope you like all the recipes when you try them! These look delicious! I'm always looking for new cookie recipes! oh yeah! I'm going to try these! YUMMY!